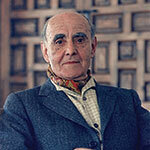 J. V. Foix was instrumental in introducing the European avant-garde movements into Catalonia. 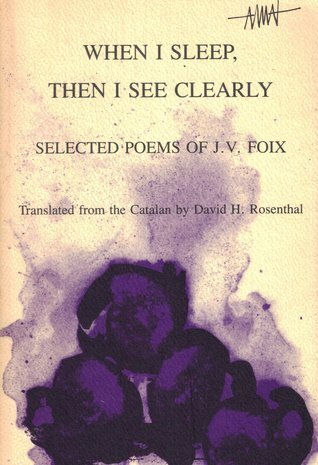 "When I sleep, then I see clearly"
J. V. Foix, When I Sleep Then I See Clearly, Trans. by David H. Rosenthal, Persea Books, 1989. Dressed in algae, gold, and fishscales. In the pool beneath the threshing floor. The monster I never name. As it dies beyond the ridge. Crazed by a sweet poison. My village sits on a circular platform. The gate of every house faces toward the square and stands perpendicular to ten streets, all cul-de-sacs. In the center of the square, one hundred meters high, rises an ancient tower without any opening. At the top flies a black flag woven with stars cut from silver paper. No one has gone beyond the square, and no one knows what lies beyond the walls that close off the streets. Needless to say, the legends that represent life outside as more frightening increase from century to century. Night and day the sky of my town, like the gonfalons of the Via Crucis, holds sun, moon, and stars motionless and palely luminous. When we young people awake, we ride bicycles and wake the neighborhood with loud trumpet blares. The girls bring chairs to the gates of their homes and sit there. They watch tenderly as we ride our races round and round the square, and they cover their chests with medals so their friends might win. We all wear jerseys embroidered with the names of our loves in colored thread. When the races are finished, we prop our bicycles against the tower and go sit at their sides. We hold hands and spend hours on end like this. Mothers open their balconies and lay out their damasks. As the hour of rest draws near, a trapdoor opens in a corner of the square, and in the midst of a cloud of incense appears Father Felix. He carries a stack of books under his arm and runs his other hand through his long beard. One day he says: “God always gives himself whole to us. Never does he give one arm or one cheek or one leg. Nor does he ever give one arm to another arm, or one cheek to another cheek, or one leg to another leg.” Another day he says: “Our village is an act of God’s love, and all things are the offspring of love.” At that moment, we look at length into each other’s eyes, and we again grasp amorous hands. Fra Felix, amidst another cloud of incense, reenters the hatch, laden with bicycles. The sky, with the sun, moon, and stars, moves gently like scenery. I wounded your lover in a duel. But you are laughing about it because you are wearing your scarlet dress. And because, unfaithful as you are, you have replaced him with the scene shifter. You would have paid for your crime had the hairdresser not been your accomplice as the two of you so grotesquely disfigured my face. One beautiful morning, however, I shall take my revenge. The ceiling won't be as awfully low then as it is now, and there won't be as many dead birds painted on it. I came upon you as your new lover gave you a lovely little box. But it wasn't a box: it was a book; and it wasn't your lover – it was me who gave you a box of watercolors in the colors of the rainbow. A thousand pink wings covered up the sky. Doors and windows were closed, and flags and pennants fluttered at each street corner. The oval shadow escaped up the street with horrifying majesty. The next morning, all the statuettes of saints in the parish had been decapitated. "We leaned a can ..."
"You get to a point," said Catalan poet J. V. Foix, "where your philosophical concerns don't change anymore. I stopped writing poetry four years ago, when I turned 82. My outlook took a radical change toward the metaphysical." In his modest stucco home, filled with paintings by friends and collaborators like Joan Miró, Antoni Tapiès, and other Catalan artists, Foix is still quite willing to reflect on the culture of Catalonia, which stretches from Valencia to Perpignan, and on its language, which has a literary tradition dating from the 12th century. Port de la Selva, where he lives, is a quiet Mediterranean village with a harbor that faces toward France. "French was always the first foreign language for the Catalan intellectuals of my generation," Foix said. "Now, the younger writers are reading German and English as well." The dominant language of the country that Catalans officially live in, Spain, is conspicuous by its absence. Not that they could ignore it, particularly while Franco's forces were determinedly trying to destroy regional cultures and languages. But Foix has always written in Catalan. "My poems are even difficult for Catalans sometimes, because I write in a classical form of the language." Until recent years, he was the proprietor of two renowned Barcelona pastry shops, which, he noted, "I have nothing to do with anymore." It is still not unusual, however, to find customers asking for the poet in addition to shop specialties such as ensaimada, a round pastry sprinkled with powdered sugar. An integral figure in the literary avant garde in Barcelona of the 1920s and '30s, Foix wrote the catalogues that presented Miró in his first one-man show there, in 1918, and later those of Dalí and Tapiès. But where the Spanish and Catalan painters were turning toward the Paris scene, the Catalan writers were occupied with their own rich history foremost. The factors that influenced them date as far back as the Middle Ages and early Renaissance, to the 13th-century poet and storyteller Ramon Llull and the 15th-century poet Ausiàs March, who was familiar with Dante and the Provençal troubadours. In various Catalan journals that Foix worked on, such as L'Amic de les Arts, La revista catalana, and Monitor, he published translations of the French surrealists and bilingual versions of other foreign texts. "Paul Eluard and Benjamin Péret used to send me their books. They were very interested in what we were doing. But it [the Catalans' work] never managed to get translated much into French." Only one collection, selected from all of Foix's oeuvre, exists in Spanish in a bilingual edition. But in a language spoken by more than seven million people, Foix is a popular poet. There are two volumes of his collected work in Catalan, and a third will appear within the next year. The first collection of his work in English translation will also be published soon. Foix's work displays a philosophical depth offset by fantasy. Stylistically, he has always written with a dual purpose, at once exploring the avant garde while maintaining a solid connection with Catalan literary tradition. He is known for his long and wonderful titles, which are like little stories in themselves. One begins, "We Arrived in That Village and No One Was There, But in the Plazas and Passageways We Could Hear the Murmur of Those Who Were and Their Dances, and the Chinks in the Walls Shall Sketch the Face of Those to Come . . . "
Often termed a surrealist, Foix insists that he has "always been independent of schools. I write beyond precepts, with absolutely no regard to how the Germans, the Americans, the French, or the Soviets write. The poet, magician, speculator of words, pilgrim of the invisible, adventurer at the limit of dreams, expects nothing for himself." His work resounds with the Mediterranean Catalan landscape and the ominous shadow of Franco, who could never be referred to directly. Let us be guardians of day at the heart's shore! --- Who dies dies not. After the Loyalist victory in 1939, many Catalan intellectuals emigrated, particularly to French Catalonia across the border, some returning only upon Franco's death. In 1941, the underground Catalan review Poesía began publication in the outlawed language, and in 1949 Foix's Les irreals omegues [The Unreal Omegas] appeared, reflecting the era of the civil war. "The censorship for poetry was freer," he said. "Now and then, when they'd read it, they might see the lines had a double meaning." Foix accepts the changing face of Catalonia. "When I was 15, the whole world was Catalan. Everything, the schools, books, all people spoke was Catalan." In the late 1920s, small groups of laborers and their families from Andalusia began to come to Catalonia for work, "but the populations never mixed. Later, whole villages came, including the mayor. So you had those speaking Spanish and those speaking Catalan." Though many younger Catalan writers have visited Foix and sent him their books, "I'm not familiar with what they're writing about. They're from a later time" than those such as Salvador Espriu, whose generation was the last to grow up before the civil war. The blossoming of modern Catalan literature encourages Foix. Yet, in the end, the problems of the artist remain: "The poet knows that every poem is a cry of liberty." J. V. Foix (1893–1987) was a Catalan poet and essayist; this photo was taken in Cadaqués, Girona, in 1969. At the start of the twentieth century, he was instrumental in introducing the European avant-garde movements into Catalonia. “The Village” is an extract from his collection of prose poems, Daybook 1918.